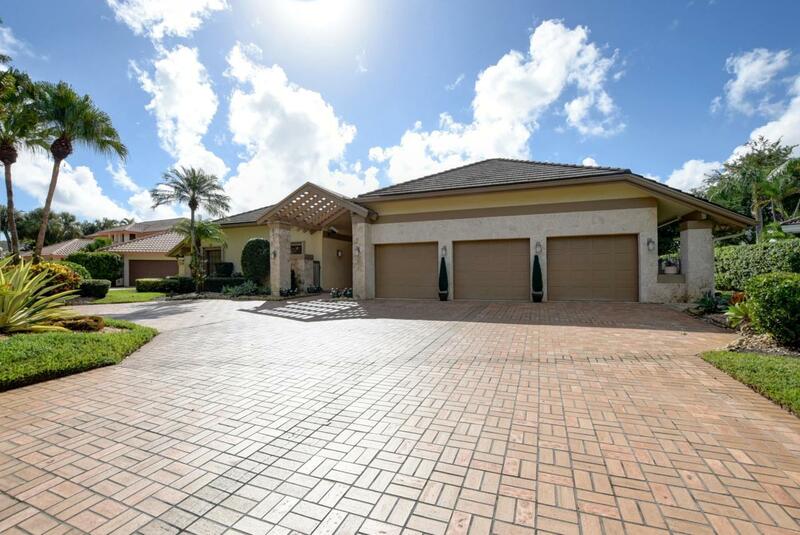 Beautiful spacious 3 bedroom, 4.5 bath custom home located on golf course lot in Mahogany Bend at Boca West Country Club. The home has been expanded to allow for a bonus room that can be used as a family room, an office or an additional bedroom. The kitchen has been redone & features a gourmet island with a Wolf range , salad sink with disposal, a Sub-Zero refrigerator & Fisher Paykel dishwasher. There is also a summer kitchen on the patio with a refrigerator, TV & gas piped directly into the barbecue grill. The spacious pool & patio area is a wonderful place to entertain family & friends. The large master suite features custom wood closets & an enlarged renovated bath. All bedrooms in the home have a private bathroom. There is a whole house generator & 3 car garage plus golf cartLarge circular driveway, garage for 3 cars plus golf cart, hurricane protection, large pool and patio area with fountain and summer kitchen, custom built-ins throughout the home, surround sound,wet bar with refrigerator in living area, gas fireplace, huge master suite with custom designed his and her closets, extended and renovated master bath, Saturnia flooring, motorized blinds, a great laundry room with cabinets, a sink, built-in ironing board and refrigerator, 3 zone A/C, 2 en suite guest bedrooms, each with private bath and patio.